1. The living room wall is bare. Pictures of my house always end up looking like the cat version of Where’s Waldo? Imagine a few inches of space between each canvas where those black lines are. It’s the height of elegant yet folky self-aware nerdiness, no? I spent a couple hours designing this and I’ve got the canvases primed and ready, but I haven’t yet busted out the brushes and smock. Artoo really deserves to look his best, so the dork in me feels a lot of pressure to get this perfect, and I’m no artist so the whole thing is kind of intimidating. I’m thinking of finally tackling it this weekend. For the right effect, I should probably, you know, get a beret. And set up an easel by a south-facing window. And turn on French accordion music. And possibly contract tuberculosis. Really get that artisty vibe going, if you feel me. 2. The front entry needs furnishing. All that’s missing are some weeds and a rusty old hubcap. 3. The bar/buffet is lackluster. I painted this brown a couple years ago when it was against a light wall in a room with a bright sofa and chairs. 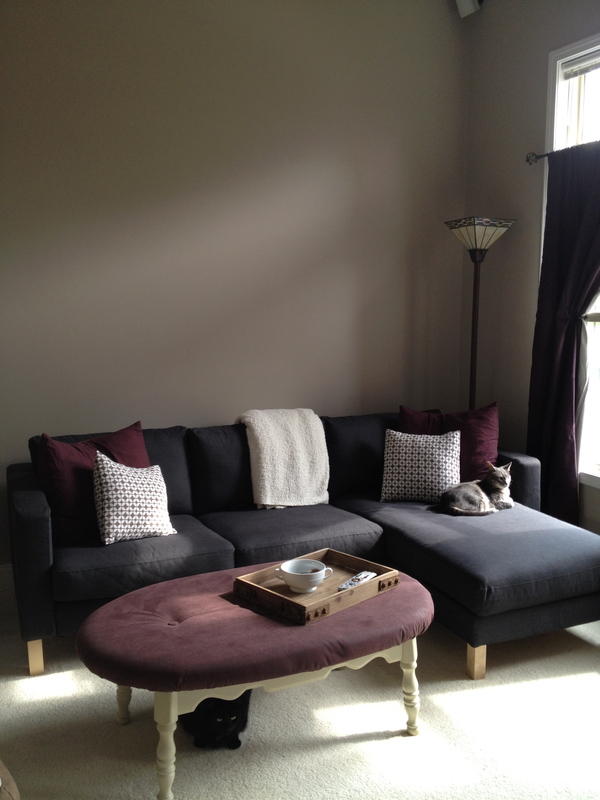 But now it looks blah next to the taupe walls and dark cherry-ish stain of the other furniture in the area. I’m thinking I should paint it a sort of medium slate blue, perhaps? I’m feeling like there’s not enough blue in my life right now. However, the last time I painted something in our garage I nearly killed us (I didn’t realize high-gloss spray paint fumes were that toxic, gah), so I feel kind of reluctant to haul out the drop cloth once more. But seriously, this thing is so boring it makes me grind my teeth. 4. The nightstands look grouty. Ick. The edges look like they’re coated in dried crumbly toothpaste. Grouty is too a word. Shush. So I tiled the tops of these black end tables before we moved with a pretty coppery glass mosaic (don’t you just lurrrrves it?) and they turned out beautifully, except for the fact that I couldn’t be bothered to put a little wood strip as a border. Mistake. The light-colored grout around the edges looks grainy and messy and unprofessional and I just want to SCREAM. I was thinking I could get some black caulk and smooth it over the edges? What do you think? Is black caulk even a thing? 5. 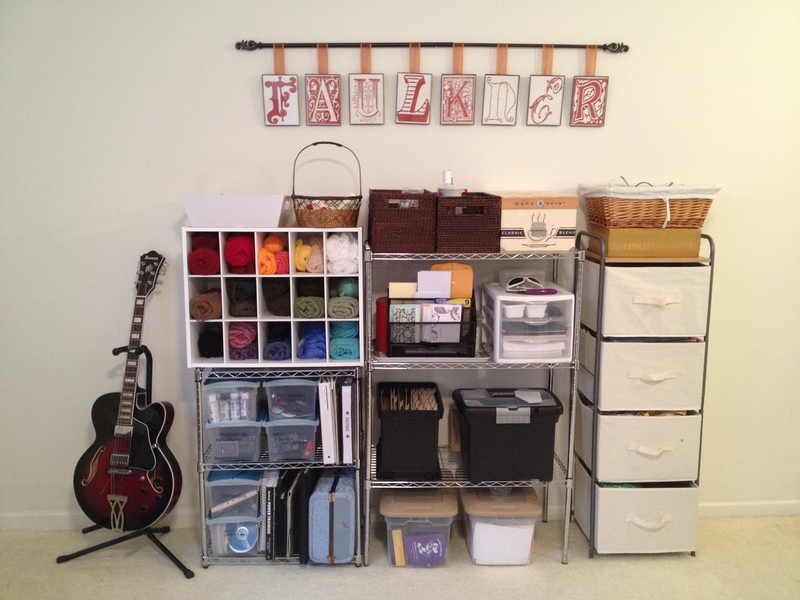 The craft/storage area is wonky. Yarn, yarn ball winder, craft paints, brushes, sponges, glue gun, glue sticks, software, music CDs, headphones, chargers, device accessories, Irish tin whistles, recorders, guitar, photos, wedding videos, memorabilia, sewing machine, pins, scissors, thread, notions, fabric, stationary, checks, post-its, notebooks, pens, pencils, markers, printer paper, coupons, file box, manuals/warranties, extension cords, tote bags, throw pillow covers, candlesticks, candles, knick-knacks, and seasonal decor. Help me, Craiglist—you’re my only hope. I seriously need a giant but cheap entertainment center or armoire in which to stash all this stuff. I’m obsessively organized, yes, so it’s at least neatly arranged and contained. But it still looks junky and cluttered and I want it to disappear behind some cabinet doors STAT. Lately, since my Craiglist search has been unsuccessful, I’ve been considering building something out of plywood and MDF and using cute fabric panels instead of doors to hide everything. But for that I’d need a Dremel (drrooolll), and believe me, I don’t need to be giving myself an excuse to buy power tools right now. Do you live near an IKEA? If so, definitely try the IKEA As-Is section. Also take a look at http://www.ikeahackers.net/ for inspiration. 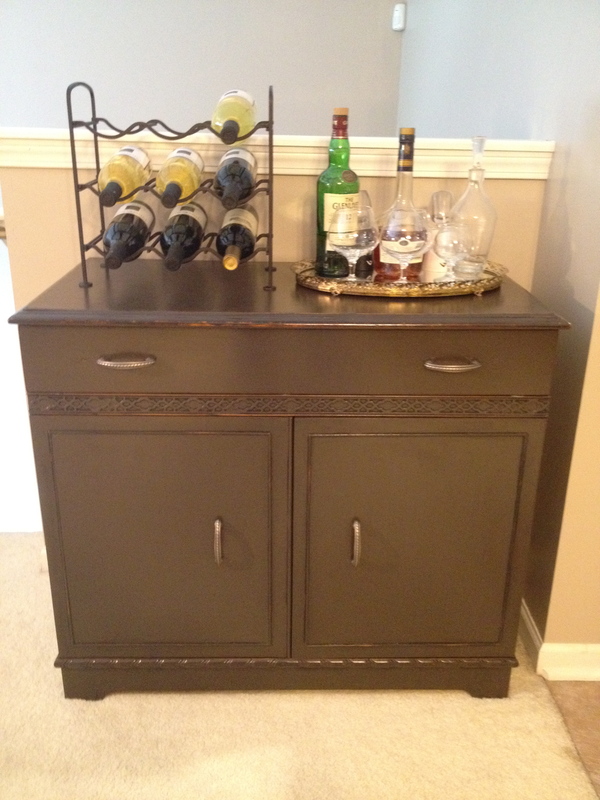 I love Craigslist for buying furniture but IKEA As-Is is topping the charts for me! Great post. You know, there’s one like an hour from here. And that’s a brilliant idea. ROAD TRIP. Hhaha! Love your living room. That coffee table is to die for!! Love yew. I made it! $10 for a crappy table from a thrift store, then painted the legs and upholstered the top with some clearance fabric from Joann’s. It turned out great but it was SO ANNOYING to do. Seriously. 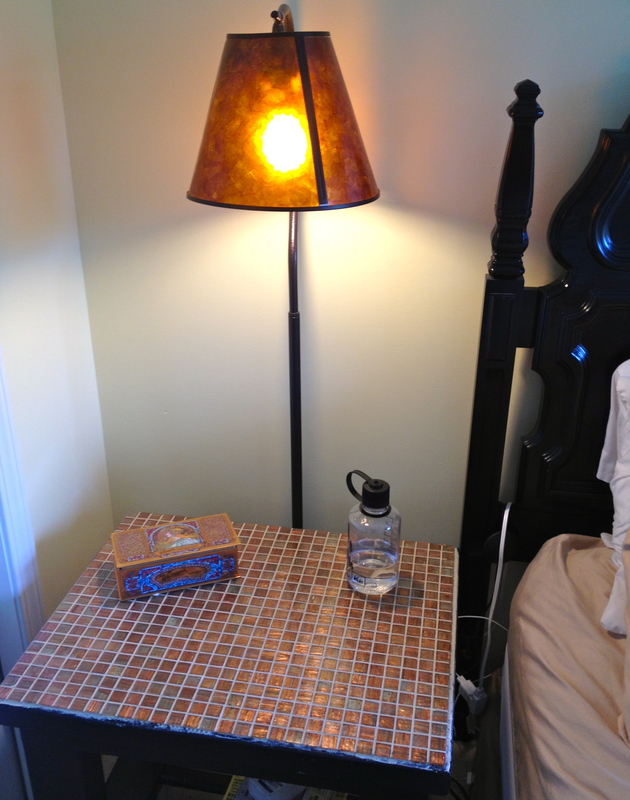 Regarding your copper tile topped table – there IS black grout. However, an easier way to make that edge black is to use a permanent marker. I had a beautiful, dark green marble fireplace surround where the builder had used white grout. Juck! I took a permanent marker and just turned the white grout into black. It was simple, easy, inexpensive and fast! By the way, your idea to add an edging of wood is spot on. That will give your little table a much more professional look. If you do not have a chop saw with mitre adjustments, get one! As a DIYer it will save you hours and hours of frustration AND open your world to projects you never thought you could do. Ideas for your entry space: Get a console table with a drawer. Put small, messy but necessary items such as driving gloves in the drawer. Keep keys in a decorative dish or basket on top. Everyone needs a mirror for a last minute check up on hair and clothing. Place two sconces or buffet lamps on either side of the mirror for flattering eye-level lighting. Don’t know about your budget but Homedecorators.com and Bellacor.com have a variety of reasonably priced console tables. You are not going to live in that condo forever. 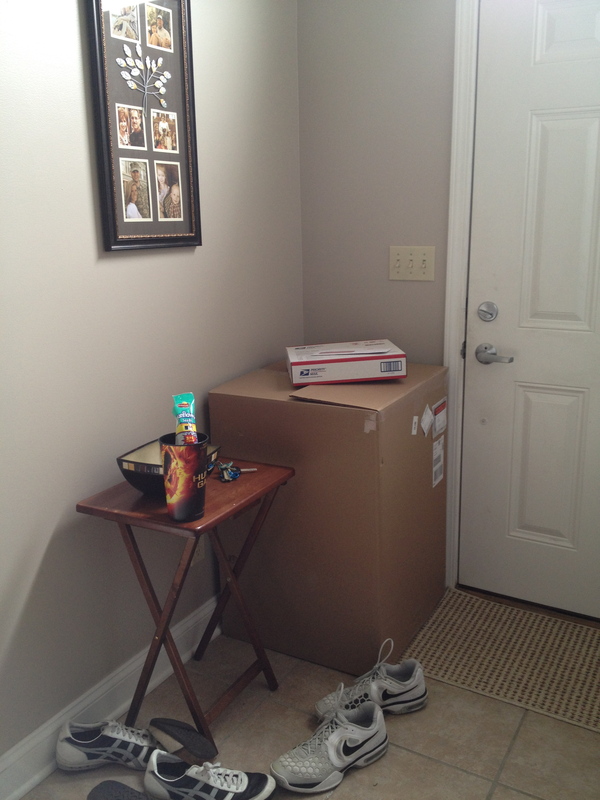 The “entry” is the first place people see and is a good place to start upgrading your furniture a bit. Oh Charlotte. There are so many power tools I want. Really, REALLY bad. One day I hope to have a chop saw, a Dremel, a better drill, and a large sander, just to name a few. But good things come to those who wait. Thanks for the info–you know, I really am considering permanent marker for those tables. Yes, I know. I have wanted a router for years! Hubby bought our chop saw with mitre ability at a pawn shop for only $30. Since I do not frequent pawn shops, I do not know if most pawn shops carry power tools. But, it is worth a try! Pawn shops seem like such “manly” places as opposed to the consignment shops that women tend to frequent. By the way, I have a Dremel but can never get it to work properly. Now I just use the Dremel attachments in my regular power drill.